Though all the period trappings you’d expect are here in this bio-musical about our first Treasury Secretary Alexander Hamilton – thanks to David Korins’ evocative scenic design and Paul Tazewell’s period perfect duds – you’re not likely to mistake Lin-Manuel Miranda’s “In the Heights” follow-up for “1776.” The cast playing our Founding Fathers is mostly non-white, and the musical vocabulary he employs is strictly that of today. This is history viewed through a pointedly and, for the most part cleverly, contemporary prism. And yet, the amount of historical detail packed into this fast-paced, propulsive production is quite extraordinary. Inspired by Ron Chernow’s epic Hamilton biography – Chernow also served as consultant – this is a sweeping narrative, albeit told in terms artfully simplistic and sometimes repetitive. 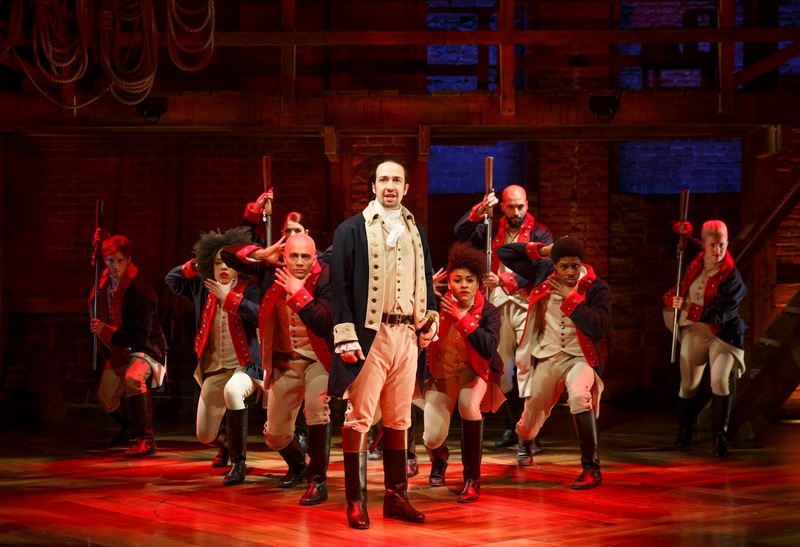 The musical’s book charts the ambitious Hamilton’s evolution from soldier to statesman as right hand man of George Washington, to economic wiz, founder of the Federalist Party, etc. as well as his complicated love life (platonic relationship with his wife’s sister and later, an adulterous affair that would embroil him in scandal), and of course, the duel with Aaron Burr, then the Vice President, that would end his life. Quadruple threat Miranda (book, music, lyrics and star) saw the rise and fall of Hamilton -- born out of wedlock in the West Indies, poor, orphaned – and the shaping of our scrappy young nation as a hip-hop story at its core, so rap music predominates though the nearly three-hour through-composed work also incorporates pop, jazz, salsa, R&B, and traditional Broadway sounds. Directed by Miranda’s “In the Heights” collaborator Thomas Kail, and choreographed almost non-stop by Andy Blankenbuehler, this is an undeniably vibrant and original piece of theater. It has something of the vibe of The Public’s rock-scored “Bloody Bloody Andrew Jackson” – in its telling of historical events in an up-to-date lingo – but this one follows a more traditional dramatic arc. Alex Lacamoire’s orchestrations, like Miranda’s score, contain little 18th century pastiche but generally the technique works. The cast is extraordinarily talented including Christopher Jackson as George Washington; Phillipa Soo as Hamilton’s devoted wife Eliza; Renée Elise Goldsberry as her sister Angelica; Leslie Odum, Jr. as Hamilton’s friend and rival Burr (interestingly, like Hamilton, an orphan); Daveed Diggs as Lafayette and later Jefferson; Anthony Ramos as Hamilton’s abolitionist friend John Laurens and later Hamilton’s tragic son Philip; Okieriete Onaodowan as James Madison; and most amusingly, Bryan D’Arcy James as a disgruntled King George. For all the extraordinary stagecraft and skill, I’d have preferred an overall less jokey approach (the lyrics are alternately sophomoric and exceedingly clever), and yet certainly as events play out in the second act with Hamilton building to a fall with sexual scandal and personal tragedy, the work takes on the requisite gravitas and becomes extraordinarily moving. At nearly three hours, the work could use some trimming. Although rife with incident, the show still feels long, even with the help of Blankenbuehler’s ceaselessly inventive movement. Though a Broadway transfer seems inevitable, and the show has been almost unanimously acclaimed as a game-changer, it’s difficult to predict how the average Broadway theatergoer will embrace the show for all its groundbreaking innovation. 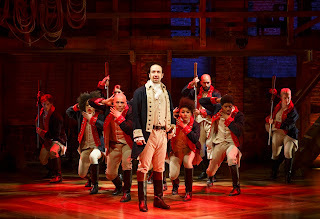 Lin-Manuel Miranda and the company of Hamilton, with book, music, and lyrics by Lin-Manuel Miranda, inspired by the book “Alexander Hamilton” by Ron Chernow, with choreography by Andy Blankenbuehler, and directed by Thomas Kail, running at The Public Theater. 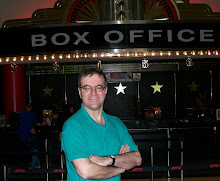 Photo credit: Joan Marcus.